﻿ JackGordon.Org: California Day with Governor Brown was June 15, 1962 at Seattle's Century 21. 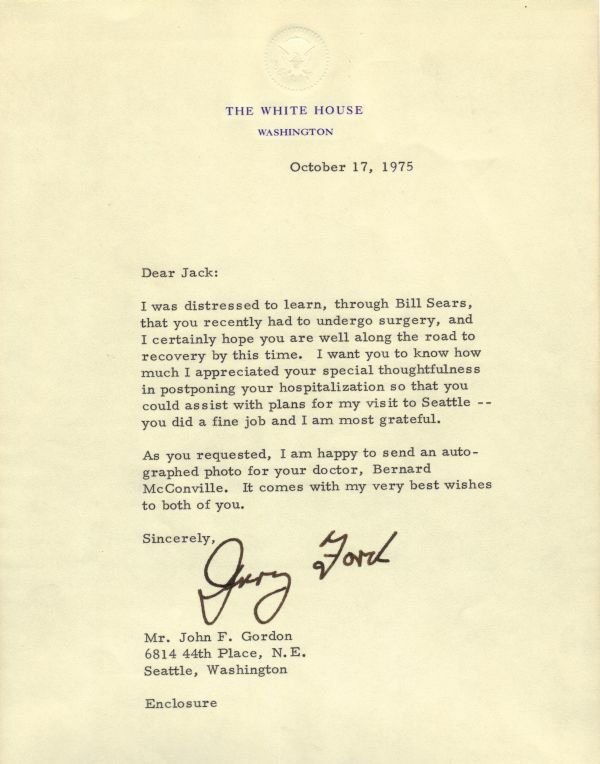 A thank you letter from President Gerald Ford to Jack Gordon, following Ford's visit to Seattle in early September of 1975. A couple of things stand out, first Ford's noticing Jack Gordon's "special thoughtfulness." Except that with Jack Gordon, thoughtfulness was never "special," it was normal and natural. The second ties in with the first in that when updating the President, Jack managed to snag an autographed photo for his doctor. It is really wonderful to be in Seattle, and I do thank you for the beautiful salmon. We are now the beneficiaries in my State of Michigan, not of salmon quite as large as that, but salmon. We started developing a few years ago by transplanting some salmon from this area of the world, and we now have tremendous supplies in Lake Michigan of Coho salmon. And we are proud of it. They don't match that salmon in size, but they do remind us of the west coast and the wonderful opportunities that all of you have who live here. May I also thank you, Governor, [Evans] for the beautiful fruit and the Bicentennial medal. As I flew in from Washington, I couldn't help but be impressed with the superb port facilities that you all have here. And that reminded me of the great significance that foreign trade has, not only for you here in Seattle but the impact that it has in a beneficial way for all of the United States. Naturally, I thought of Seattle when I flew out in Air Force One. I suspect that was made--wherever the plant is--right here. [Laughter] It is a great aircraft. And of course, Seattle, with the Boeing Company, contributes very significantly not only to the aerospace industry as a whole but, very importantly, to our national security. And I compliment the company and particularly its employees for this contribution to our domestic as well as military security. But also as we flew, as we arrived in the Seattle area, we traveled over some great, great country, the Northwest. I saw the wonderful fields, the grain growing. And it couldn't help but have an impact on me coming from my part of the country and, particularly, now from Washington, D.C., to appreciate how vast our Nation is and how diverse it is, not only in agricultural land but people, natural resources.